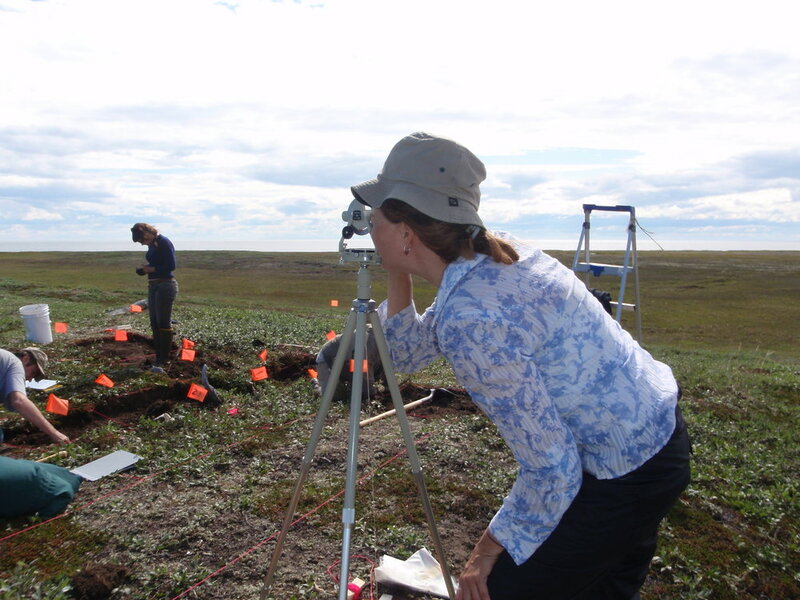 In the quest to discover more about prehistoric human development and settlement in and around the Bering Strait, scientists have long probed archaeological sites in Northwest Alaska in search of artifacts, architecture, and other clues for how the Inuit culture evolved. Perhaps the most well-known site has been Point Hope, Alaska, one of the oldest known occupied human settlements in North America. What hasn’t been fully explored in the region is a promontory on the northern coast of the Seward Peninsula: Cape Espenberg. Considered the “last great unstudied beach ridge sequence in Northwest Alaska,” according to Dr. John Hoffecker of the University of Colorado’s Institute of Arctic and Alpine Research (INSTAAR), Cape Espenberg was a robust Iñupiat community from 1000 A.D. to about 1800 A.D. The cape is the focus of a three-year study supported by the National Science Foundation and co-led by Hoffecker and Dr. Owen Mason, also with INSTAAR. Their project aims to “track change over time to further develop an understanding for the formative period of Iñupiat culture,” said Hoffecker. The beach at Cape Espenberg today. One thousand years ago, this was the site of a robust Inuit community. Photo by Owen K. Masen. Specifically through an interdisciplinary effort with archaeologists, soil specialists, paleoecologists, and other experts, they plan to map the cape’s beach ridges, complete partial excavation of myriad sub-terranean homes, collect artifacts, and sample the soil to better understand how the former inhabitants survived. Before unearthing clues about the economy, the crew unearths the house. Photo John Hoffecker. The crew excavates entirely by hand. After identifying a subterranean home, they outline the plot and get to work. Photo John Hoffecker. One of the many artifacts unearthed during this summer's field season. Photo John Hoffecker. In addition, the team will complete an extensive map of the area and overlay it with evidence of the former occupants’ lifestyle, as pieced together by the artifacts and information from soil micromorphology they will collect. The team will focus on the period between 800 and 1400 AD, when major climate change occurred in conjunction with a cultural transition in the greater Bering Strait region. The beach ridges at Cape Espenberg was formed by marine deposits and windblown sand, and its residents built their subterranean houses in sand using whale bone and drift wood to strengthen the structures, said Hoffecker. He and his team spent this summer’s field season surveying the ridges and selecting the main spots for next year’s research, when they will concentrate on ridges 6, 5, and 4. This summer they were a team of eight, and next year that number will grow as they bring a larger crew, camp staff, and students from nearby communities as part of a National Park Service mentorship program that aims to involve local Native Alaskan communities in the project and other scientific pursuits. This summer was Hoffecker’s first on the cape, and he said the abundant wildlife and remote location often felt prehistoric. After a summer of recon, he said one of next year’s biggest challenges may be dealing with the more modern mammals: ground squirrels, which disrupted excavation.